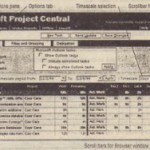 Tasks in the timesheet are shown with various lndicators, 50 you can see at a glance which have been declined, which are pending, and which have been successfully delegated. If you’re not sure what an indicator means, mouse over it for an explanation. When you have at least one delegated task, you have additional options for how to, view (and specifically how to filter) the timesheet. Clear the Show checkbox If you don’t want to see any of the delegated tasks. Disable the Show My Tasks check box if you don’t want to see undelegated tasks. Of course, if you disable both checkboxes, youIlsee no tasks. If you enabled the Show field, you can choose from the three filter options on the drop-down list. Project managers aren’t omniscient (although you may know some who think.they are). There will always be tasks that didn’t get thought of during the planning stages’: If you’re a team member who finds that you are spending a considerable amount of time on a task that Isn’t listed as part of the project, you’ll want to alert your manager to include it. 1. Click the Project drop-down list and choose the project to which the task should be added. 2. Choose an outline-level option. You can make the new task at the highest outline level so that it appears on par with summary tasks. If this is what you want, c choose the first option. 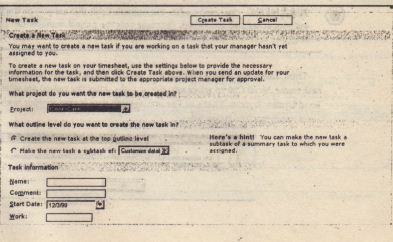 Or, you can make the new task a subtask of a summary task to which you’re currently assigned. In this case, select the second option and choose a summary task from the drop-down list. 3. Type a descriptive name for the task in the Name field. If you want to add additional information, type a short comment in the Comment field. 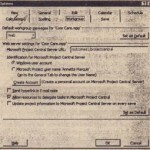 Select a start date for the task and type an estimated task duration in the Work field. Make sure that you indicate whether the duration is in minutes, hours, or days by using this format: 10m, 10h, or 10d. 4. 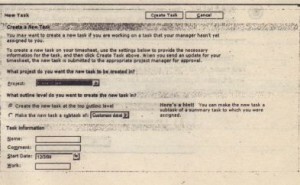 Click Create Task to place the new task on your timesheet. S. Select the task and click Send Update to notify your manager. Fishing for a pat on the back? You can send an unsolicited task update quickly and easily with a couple of clicks in your timesheet. First, click in the Actual Work field for the date(s) and task(s) you want to update. Type in the number of hours (or minutes or days) you’ve wor~ed on the task. If the work field currently shows Oh, it’s probably best if you update the task in hour increments because that’s what your manager is tracking. • The task is not a delegated task for which you are the lead. • the task is not a summary task with existing subtasks. • The task is not a non-working time task. 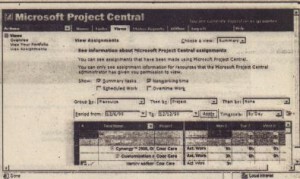 • The task was not transferred from Microsoft Outlook. That may not leave a lot of tasks left on your list that you can delete, but if you have one that meets these criteria, you can delete It by selecting it and clicking the Delete button. 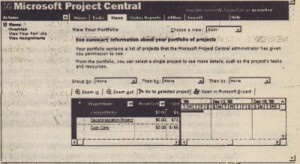 The By project option is called Your Portfolio. Your Portfolio, shown in Figure 16.8, contains a list of projects that your Project Central administrator has given you permission to see. You can choose to view your portfolio in one of five views: Cost, Earned Value, Summary, Tracking, and Work by choosing a view from the View drop-down list. You can also group a view by up to three levels. Each view represents a table of data. However, only a couple of the table’s fields are visible. To see additional fields In the table display, drag the vertical split bar between the table and the Gantt Chart. 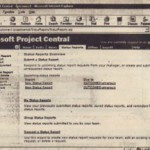 If you have Microsoft Project available on your system, you can also click Open in Microsoft Project to have all the tools of Microsoft Project at your disposal. To change the focus of the data to task assignments, click the View Assignments link on the Actions pane. Although View Assignments has only one view available, you can choose to display Summary Tasks, Summary Roll-up, and Non-Working time In the Summary view.